She has particular expertise in helping vulnerable young children whose communication issues are related to attention disorders, sensory needs, autism, and executive functioning challenges. She is the author of a new book entitled Getting From Me To We: How To Help Young Children Make And Keep Friends — (Pubisher: Woodbine House). 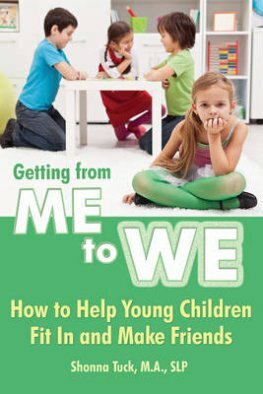 This book was written to help parents and professionals support young kids who are having trouble fitting in their classrooms, with connecting with their classmates and with children outside of school. Recipient of the Gold Ribbon Award for Connected Care at the Children’s Hospital of Eastern Ontario 2015.